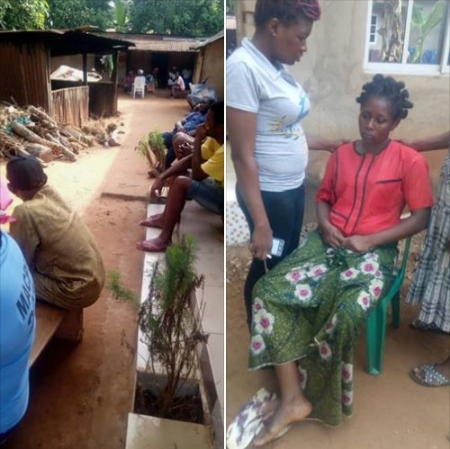 A Nigeria man has met his untimely death after he went to separate a fight between a couple in Umueze village, Isuaniocha, Awka North Local Government Area of Anambra state. one of their family friends called on phone for help that her husband was beating her. Mrs. Mkpume said she wanted to go alone but the husband insisted on going with her not knowing it would be his end. It was gathered that while they were still making peace between the couple, about five boys whose faces were familiar - appeared and pounced on the deceased who was standing just in front the gate. Mrs. Mkpume further explained that while they butchered her husband with axe and matchete, the couple that invited them to make peace - ran inside and locked the gate leaving her and her husband to the mercy of the boys.